The Natural Bridge is located off Wildwood Road, a connector between Highway 3 and Highway 36 near Hayfork, the Natural Bridge has mystical, historical and geological significance. Natural Bridge is a 150 feet long and about 30 feet high rock arch. The site is the location of the Bridge Gulch Massacre, also known as the Hayfork Massacre or Natural Bridge Massacre, on April 23, 1852. Ancient stories of the Wintu Indians which inhabited much of Trinity County before the Gold Rush, say that Natural Bridge was formed when a mystical man, b earing a huge bundle of hides, came down Bridge Gulch. Tired and hungry, he slipped the bundle from his back and it rolled into the creek. The Indians called the bridge “Kok-Chee-Shup-Chee”, or “Bundle of Hides,” because of the texture and color of the walls. 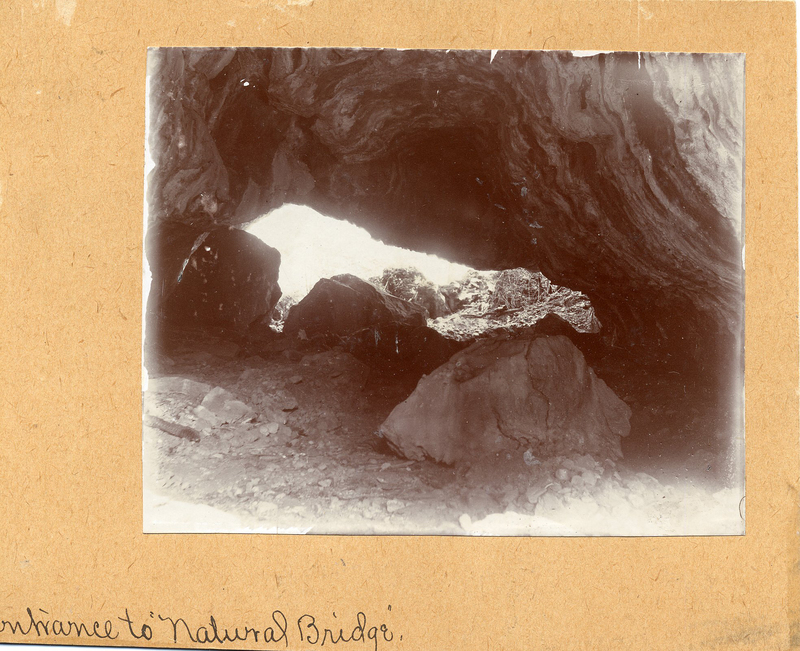 The early pioneers of the Hayfork Valley frequently used Natural Bridge as a picnic site. This is borne out by the names and dates engraved in the limestone rock. In 1852, a well-known citizen of Weaverville, J.R. Anderson, was killed and a small herd of his cattle were driven off by a band of Wintu Indians. A few hours later, Trinity Sheriff William H Dixon and a number of men were in pursuit. After several days of tracking through the rugged mountains, Dixon’s party set up camp on Hayfork Creek while scouts were sent out to locate the Indians. Late that afternoon, a scout reported sighting an Indian Rancheria a few miles from Dixon’s camp. From a vantage point on Natural Bridge, the scout could see smoke from their campfires a short distance upstream, and even described children playing. Under cover of darkness, the party quietly made their way up the narrow draw known as Bridge Gulch and surrounded the encampment. When the morning sun broke through the trees, the camp began to stir. As men, women and children of the tribe gathered to hear their leader speak, a shot rang out and he dropped to the ground. Chaos broke out as Sheriff Dixon’s men began firing at anyone they could line up in their gun sights. Soon, however, the shooting ended as Dixon’s men ran out of targets. When all was quiet, the party cautiously made their way down the mountainside and into the Wintu camp where smoke from burning tepees curled toward the sky and the smell of gunpowder hung in the morning air. All that remained of the 150 Wintus were three children (accounts vary). The band that had killed Mr. Anderson and driven off his cattle were not among those who had died in the camp. Natural Bridge is a natural limestone arch thrown across this narrow ravine by nature. The exterior of the opening measures about 100 feet wide and 50 feet high. The archway spans over 200 feet. The exterior mass of the bridge was solid until water, through the course of time, forced itself through the soft limestone, creating the passage. Natural Bridge is administered by the Hayfork Ranger District of the Shasta-Trinity National Forest.